Rumanian patriot; born at Bucharest Jan. 29, 1809; died at Jerusalem May 2, 1844. His great-grandfather, Chelebi Mentesh Bally, banker to the grand vizier of Constantinople, aided Nicolas Mavrocordato to ascend the throne of Wallachia in 1716, and was taken by him to Bucharest, where, in recognition of his services, he was made a court counselor and received various privileges and exemption from taxation for himself and his descendants. Bally's grandfather, Isaac, inherited the privileges of his father, and became the intimate counselor of many of the Phanariot princes: he was especially favored by Mavrogheni, whom he aided to mount the throne. His father, Abraham, studied at Leipsic, then established himself as wholesale merchant in Bucharest, and exercised considerable influence with the Boyars. When Davicion Bally was twelve years old his father died, and it seemed as if the son would have to terminate his studies at that age, for the father's partner defrauded the family out of almost all their possessions; but, thanks to an excellent library which the elder Bally left Davicion, he familiarized himself with the Rumanian, Greek, French, Italian, and German languages, in addition to Spanish, which he had learned in his father's house. He also made considerable progress in the study of Hebrew. 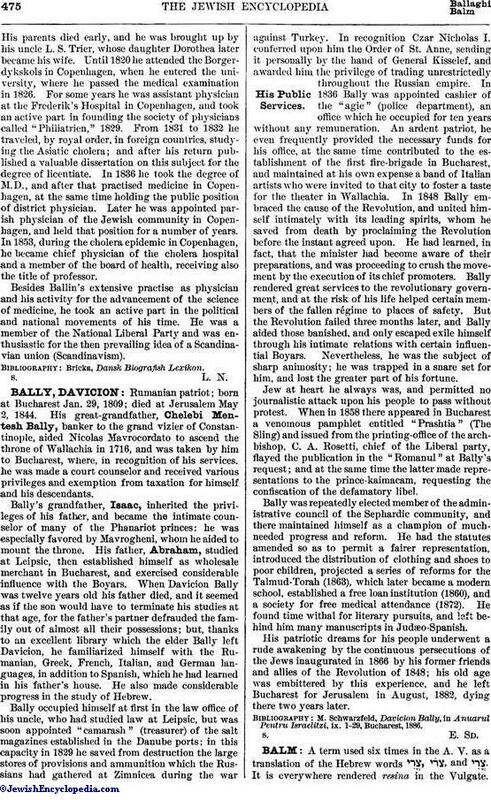 Bally occupied himself at first in the law office of his uncle, who had studied law at Leipsic, but was soon appointed "camarash" (treasurer) of the salt magazines established in the Danube ports; in this capacity in 1829 he saved from destruction the large stores of provisions and ammunition which the Russians had gathered at Zimnicea during the war against Turkey. In recognition Czar Nicholas I. conferred upon him the Order of St. Anne, sending it personally by the hand of General Kisselef, and awarded him the privilege of trading unrestrictedly throughout the Russian empire. In 1836 Bally was appointed cashier of the "agie" (police department), an office which he occupied for ten years without any remuneration. An ardent patriot, he even frequently provided the necessary funds for his office, at the same time contributed to the establishment of the first fire-brigade in Bucharest, and maintained at his own expense a band of Italian artists who were invited to that city to foster a taste for the theater in Wallachia. In 1848 Bally embraced the cause of the Revolution, and united himself intimately with its leading spirits, whom he saved from death by proclaiming the Revolution before the instant agreed upon. He had learned, in fact, that the minister had become aware of their preparations, and was proceeding to crush the movement by the execution of its chief promoters. Bally rendered great services to the revolutionary government, and at the risk of his life helped certain members of the fallen régime to places of safety. But the Revolution failed three months later, and Bally aided those banished, and only escaped exile himself through his intimate relations with certain influential Boyars. Nevertheless, he was the subject of sharp animosity; he was trapped in a snare set for him, and lost the greater part of his fortune. Jew at heart he always was, and permitted no journalistic attack upon his people to pass without protest. When in 1858 there appeared in Bucharest a venomous pamphlet entitled "Prashtia" (The Sling) and issued from the printing-office of the archbishop, C. A. Rosetti, chief of the Liberal party, flayed the publication in the "Romanul" at Bally's request; and at the same time the latter made representations to the prince-kaimacam, requesting the confiscation of the defamatory libel. Bally was repeatedly elected member of the administrative council of the Sephardic community, and there maintained himself as a champion of muchneeded progress and reform. He had the statutes amended so as to permit a fairer representation, introduced the distribution of clothing and shoes to poor children, projected a series of reforms for the Talmud-Torah (1863), which later became a modern school, established a free loan institution (1860), and a society for free medical attendance (1872). He found time withal for literary pursuits, and left behind him many manuscripts in Judæo-Spanish. His patriotic dreams for his people underwent a rude awakening by the continuous persecutions of the Jews inaugurated in 1866 by his former friends and allies of the Revolution of 1848; his old age was embittered by this experience, and he left Bucharest for Jerusalem in August, 1882, dying there two years later. M. Schwarzfeld, Davicion Bally, in Anuarul Pentru Israelitzi, ix. 1-29, Bucharest, 1886.